I don’t have any bad review about my college as I am getting all the needed amenities and opportunities to build my career from here. Vogue welcomes fashion aspirants and transforms them into professionals. Vogue Institute is home to young & creative minds. 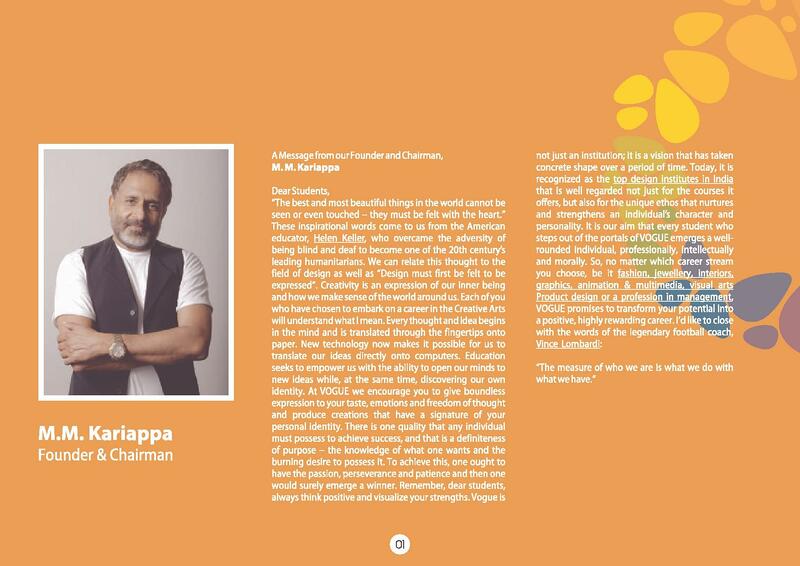 It gives a lot of preference for practical skills that eventually help in building a strong career base in art & design fields. If you are creative and have a passion for fashion, Join Vogue! Overall my experience at college was good. I got to learn alot and made some wonderful friends for life. Each of the study centres, helps workplace and class rooms are aesthetically designed in our college.Teachers give their 100% in classrooms.Our senior students were also very helpful.We got lots of help from our Alumni also. 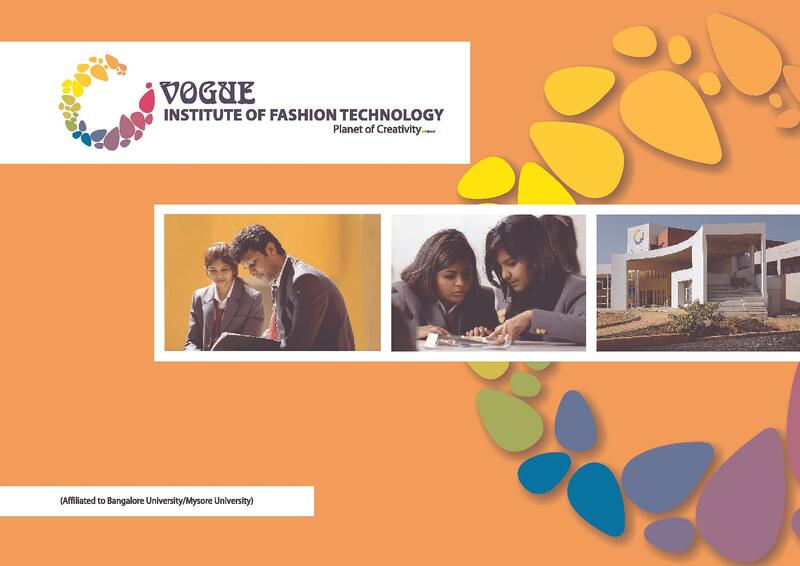 Vogue Institute of Art and Design (Formally Vogue Institute of Fashion Technology), Bangalore has been established to provide industry specific education to the students and it is continuing its mission even today. The new campus of the college has been built in elite Apparel Park. The institution has rated as the top fashion designing colleges in India has been focusing on providing training that promotes employable skills, and enhances social relevance. The institution imparts training of various academic programs right through vocational to post graduation level, specializing in Design, Management, and technology. Vogue Institute of Fashion Technology’s new campus is an architecture and design marvel, built with state-of-the-art post-modern amenities. This campus has marvelous look and has state of the art facilities. The college provides Diploma, certificate, Graduation and post-graduation courses in fashion, designing, arts, and media. College provides hostel and transportation facilities to outstation students. It provides Master Degree Programs, Undergraduate Programs, and Graduate Diploma Programs. 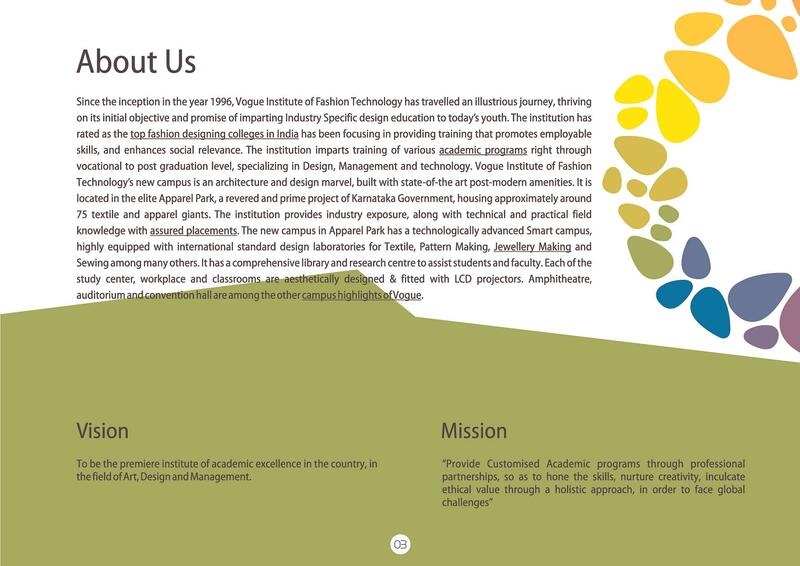 is located in the city of Bengaluru that is known for its fashion institutes and IT industry. 1 hour drive from Kempegowda International Airport, Bengaluru. In the world of Fashion, Vogue’s Mystique Designer Awards is very well- known. In the shows held annually, the graduating students display their collection which projects their creativity and professionalism. Renowned celebrities from the field of Fashion, Lifestyle and Films have been present at the glittering events. Why Join Vogue Institute of Art and Design? The college has 6 laboratories including Computer Lab, Stitching Lab, Cutting Lab, etc. which are high tech and well equipped so that students can perform their experiments and also do additional research. College also has classrooms that contain LCD projectors to aid teaching. College has a dedicated Training and Placement cell that invites companies every year for campus placements. The number of students placed is increasing every year that shows the hard work of the members of the cell. Students are placed in top companies like Levis, Lifestyle, Reliance Trends, Big Bazaar, etc. 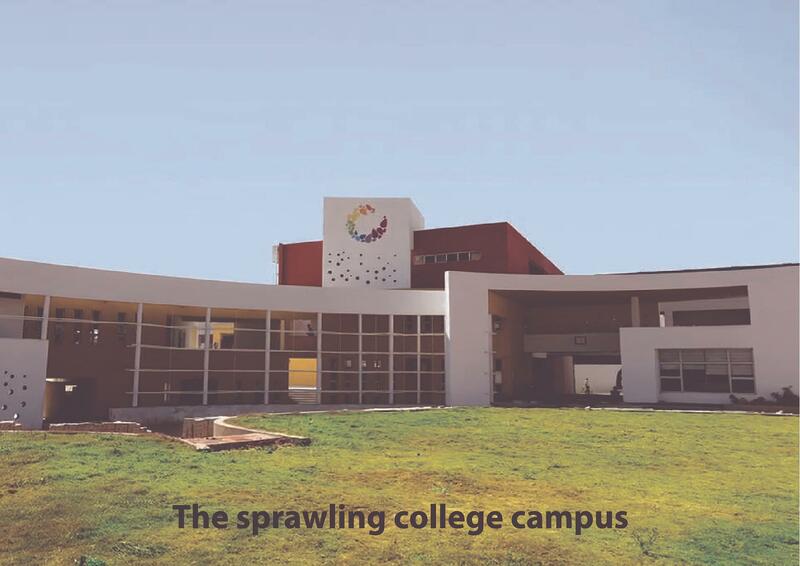 College also has its own Auditorium and Amphitheatre so as to conduct seminars, Fest and Events. College also has facilities for the sports and indoor games. Hi Tasmiyah, Yes. You can go with masters but please read the Admission Guidelines before getting Admission in the course. Hi Faisal, To get the information about Fee structure Please contact on 080-41128513 , 41478547.
confused to select college for fashion designing as NIFT entrance exam is also over and i was not able to give it..
what kind of entrance exam we have to give to take admission in vogue institute of fashion technology bangalore? Any entrance exam required for b.sc in fashion design ?? Hi Garima, please contact the admission office for Entrance Exam Information. What's the fee structure for fashion designing? Hello Gurupriya, this college provides MBA in Fashion Design. For more details, visit te official website. "If you are creative and have a passion for fashion, Join Vogue!" We did not have an entrance exam at the time of admission. I opted for this college mainly because my friend passed out from this college and she had nice things to say bout it, her overall experience at the college was worthwhile.And Since this college in specialzed mainly in art and design unlike other colleges i thought this college is best for me. I am doing fashion designing in weekend batch.My admission in this college is simple.There is no need of entrance and also no need for a definite percentage of marks.According to the seating capacity, seats are divided. The admission process is purely provisional. After completing 10+2 in arts I opt for this course in this college.The admission is easy but expensive.No entrance needed.